Following World War II, the United States experienced a financial boom in which millions of Americans enjoyed the benefits of national economic growth. Jobs in government, manufacturing, and service industries transformed the nation into an affluent society that most people could not have imagined years earlier during the Great Depression. Federal programs such as the G.I. Bill helped families buy homes, start businesses, attend college, and build generational wealth in unprecedented numbers. These opportunities were not available to everyone, however. By 1968, 35 million people lived below the poverty line of $3,130 per year for a family of four, and $1,540 per year for individuals. As an emerging middle class migrated to the nation’s developing suburbs, the poverty of coal mines, migrant farms, and inner cities became invisible. 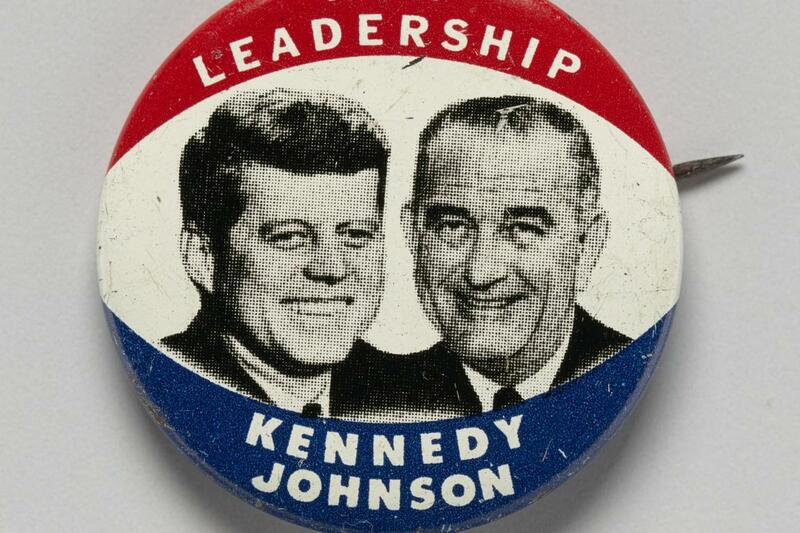 A 1960 presidential campaign folding tab, metal button for John F. Kennedy and running mate Lyndon B. Johnson. As a presidential candidate in 1960, John F. Kennedy was moved by the levels of poverty he saw in states such as West Virginia. Once he was elected president, books on poverty, including Michael Harrington’s The Other America, influenced Kennedy’s decision to create an antipoverty agenda.